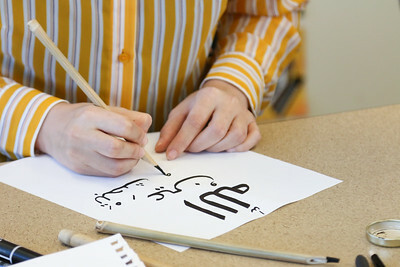 Students learned the entire Arabic alphabet, researched the cultural ties of calligraphy to Islam, and developed basic techniques of working with bamboo pens and inks. 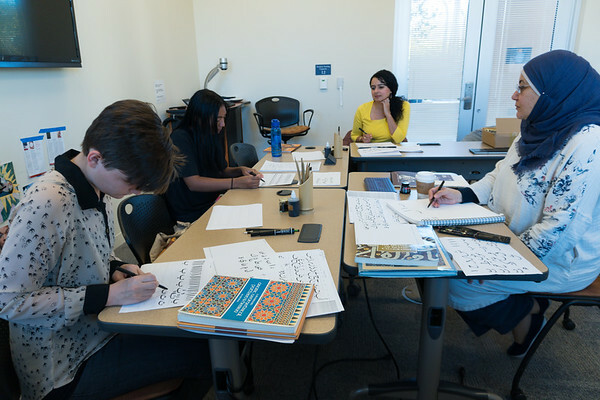 Assistant Professor of Religion and Islamic Studies Nassima Neggaz led students through an intensive study of the Arabic alphabet and complementary artform, calligraphy, during the January Interterm. “Arabic is absolutely necessary to study, if you want to do anything with the region,” explains Neggaz, who teaches courses in Islamic Movements and Islamic History this Spring. In three weeks, students learned the entire Arabic alphabet, researched the cultural ties of calligraphy to Islam, and developed basic techniques of working with bamboo pens and inks. Students designed final projects showcasing all of their newly-acquired skills with individual coaching from a calligrapher. Amid grammar studies and dictations, Dr. Neggaz and students discuss how speakers at the language’s hearth are shifting focus. The political climate in the modern Arab world has led to some concern that cultural significance of preserving semantic languages is declining, especially among youths. “The most important challenge -and the most difficult to face- is that people in the Arab world don’t think Arabic will help them in the future,” explains Neggaz. New College currently offers courses in elementary and intermediate Hebrew, but Dr. Neggaz and students hope to see growth of additional language courses to complement the Religion and International Studies areas of concentration. Dr. Neggaz intends to offer a similar ISP next January. –Anna Wright is an intern in the Office of Communications and Marketing.